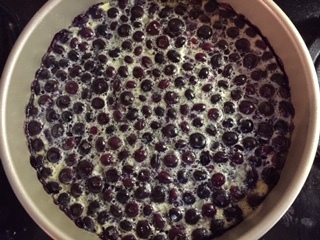 Sometimes a blueberry clafoutis just demands to be made and that’s that. Meantime, I went to go see my ENT today. His wife got a handknit from me years ago but I’d never knit him his own something; it was time. A Malabrigo Mecha hat, thick, densely knit, warm, and soft. He quite liked the dark teal green. He tried it on for size, very pleased. Turns out he’s taking a week off starting tomorrow to visit his daughter’s family, and where she lives it’s been snowing a lot.